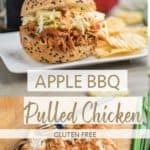 These Apple BBQ Pulled Chicken Sandwiches are SO delicious- and also easy to make for a crowd (I made them for a group of 25 last weekend!). The Sweet Onion Apple BBQ Sauce is homemade, and a healthier, low-sugar alternative to store bought sauces. One of the most important things I hold to when deciding how to eat and how to feed my family is to keep the added sugar low. Not no-sugar. Because that would just be boring. Life without chocolate chips? No thank you. I loved BBQ sauce as a kid, and was pretty sure my son would love the sticky-sweet sauce smothering his chicken as well. I just wasn’t about to pour on a store bought bottle, and make a meal with as much added sugar as is recommended for a whole day. I make a lot of condiments homemade, because I like to control the ingredients and quality. I often recommend buying your favorite store bought brand to save time in a recipe like this, but that’s not recommended here. Not only is this homemade sauce made with the delicious flavor of slow-cooked apples and spiked with cinnamon, but it’s also such a healthier choice. A typical store bought BBQ sauce has 70 calories and 16 grams of sugar per serving (2 tablespoons). Since these sandwiches are dripping in sauce, I recommend using 1/4 cup of sauce per serving– that would make this sandwich have nearly as much added sugar as a can of cola, and double the amount of sugar intake recommended for a whole day. 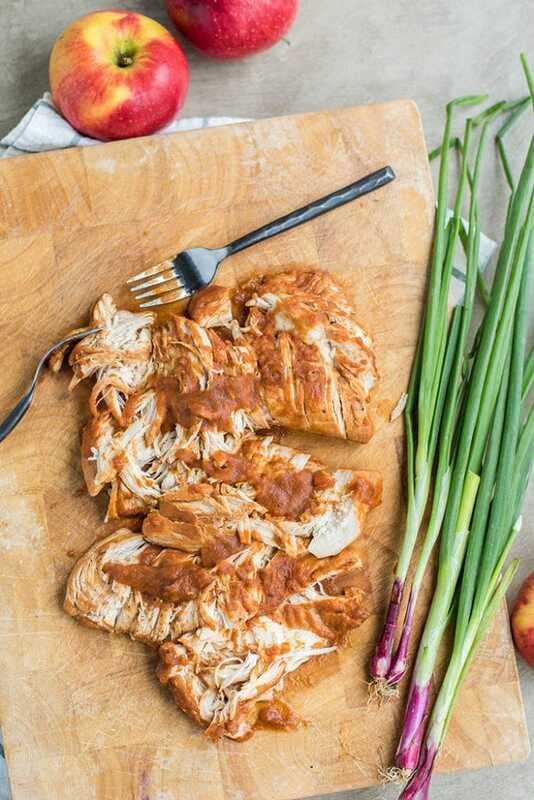 The sauce in my Apple BBQ Pulled Chicken has 30 calories, and only 5 grams of sugar per serving. Those 5 grams do come from a small amount of added brown sugar and molasses, but also from the fruit used in the sauce- fruit that adds nutrients and fiber rather than just empty calories. And the best part? No one is going to think you’re serving them “healthy” food. These were such a hit at my son’s birthday party last weekend. Several of my friends asked if the recipe was up on the blog yet, because their husbands loved the chicken. That’s when I know my recipes are hitting the mark. Way healthier than the “typical” version, but so good no one will suspect you’re slipping them a substitute! Make is Gluten Free: Use a gluten free bun to keep these gluten free. I also love this chicken as a salad topper (so much flavor! ), and I know they would make a really amazing BBQ chicken taco wrapped in corn tortillas. 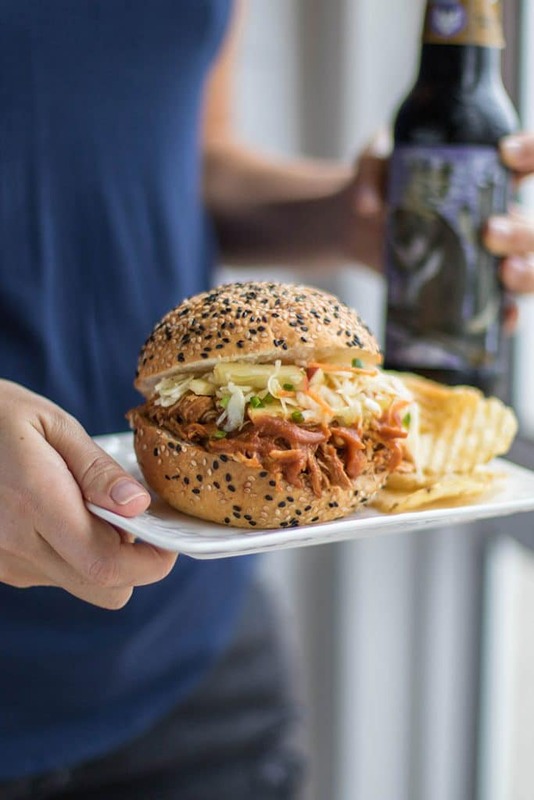 Make it Ahead: The BBQ sauce and the pulled chicken are both made in the slow cooker- so while they do take time, there is very little hands on time. You can make a big batch of BBQ sauce the day ahead, and then start the chicken in the crock pot the next day. I am sure the sauce would be fine if made on the stovetop (in a fraction of the time), but the chicken really is the most tender if slow cooked on low. 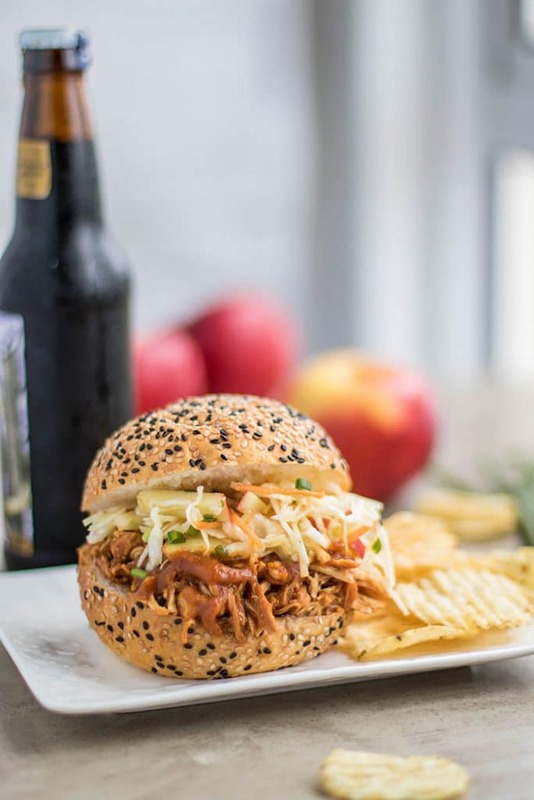 These delicious sandwiches are piled high with tender chicken slow cooked in a tangy Sweet Onion Apple BBQ Sauce, and layered with an apple slaw. Add the bbq sauce to a slow cooker, and turn on high heat while preparing the chicken. In a frying pan, add olive oil, and heat over medium high heat. Add chicken breasts, and season liberally with salt and pepper. Brown both sides of the chicken, but don't cook through. Add chicken to the crockpot. I allow it to stay on high heat until the BBQ sauce has begun to bubble, then I turn it on low for 3-4 hours. You can cook it on low the entire time if you'd prefer. Cooking the chicken on high is fine (for 1 1/2-2 hours), but the chicken doesn't stay as moist. Once chicken is cooked through and very tender, take the chicken breasts out, and shred them with 2 forks. The chicken should come apart very easily. Add the chicken back to the sauce in the crock pot, and mix well. Turn off the heat after shredding the chicken to avoid it drying out. To make the slaw, add shredded veggies to a bowl. After cutting apples, add to a dish with lemon juice and some added water to keep from browning. Add the ingredients, apple cider vinegar down, to a jar, and shake well. Drain the apples, and add to the slaw ingredients, then toss the slaw with the dressing to coat well. The slaw can be made a day ahead of time if needed, but I prefer it on the first day while it's still crisp. 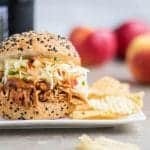 Layer shredded chicken and apple slaw on buns. We found that no other condiments were necessary with the flavorful sauce and the dressing on the slaw. Slow cookers are one of my favorite ways to cook – especially if I have a crowd to feed. Filling a crockpot early and then having time to work on other parts of a meal is a great way to have a large portion of flavorful food ready. I use my crockpot for soups, chilis, and for tender meat like in this recipe. The Sweet Onion Apple BBQ sauce is incredible! This is the best reminder that reducing calories doesn't mean reducing delicousness. 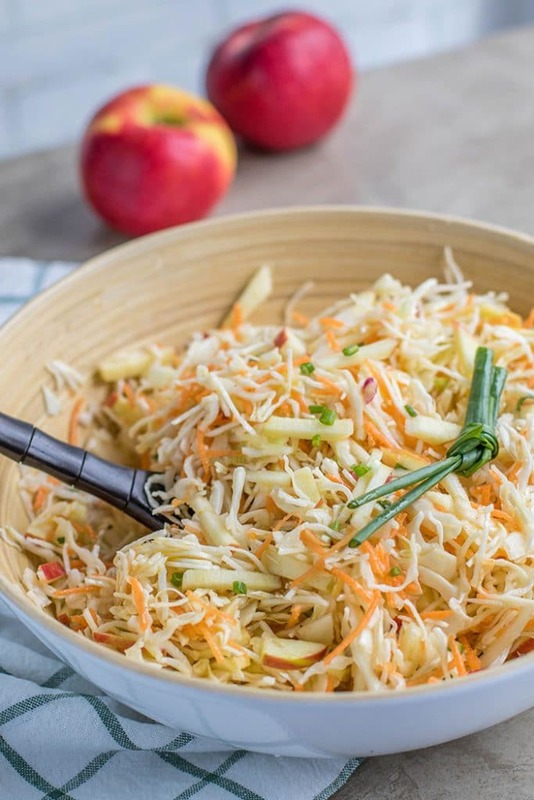 I love the combination of flavours and that apple slaw is on my make soon list! I agree! It can be just as good (or better) by using whole foods! 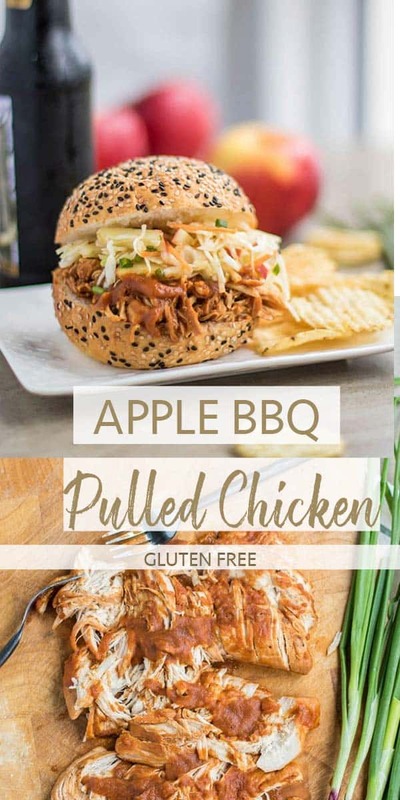 Oh wow, I love pulled chicken sandwiches and this recipe looks so good, I love the flavour combination! Slaw on top of BBQ in a sandwich is AMAZING and I am so glad other people agree! This looks delicious, and those buns are so cute! I would love to taste that sauce! It sounds sooo yummy!!!!!!!! What I do to help thicken up sauces made in the crockpot is to tilt the lid so steam can escape for the last hour or so of cook time. This might not help so much now that you have it done! If you have sauce left over that you'd like to thicken, maybe try just simmering it down in a saucepan to reduce it? I am so glad you liked it! I served these sandwiches at my son's birthday party last year and everyone was asking for the recipe!